Searching for a joyful way to send season's greetings to everyone on your list? 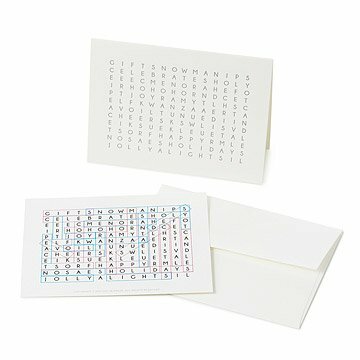 Find inspiration in Alexandra Daley's word search cards that feature over thirty hidden, holiday words, allowing senders to deliver good tidings their own way! This interactive set of salutations won UncommonGoods' Greeting Card Design Challenge by leaving a lasting impression with our community about how much fun a non-denominational card can be. Fusing pristine craft and distinguished technique, Alex and her team mix all of the inks used by hand, in order to create rich, unique colors that don't exist in the Pantone spectrum. Every card is then hand-printed on a vintage Vandercook Cylinder Proof Press, trimmed and creased to give every print a professional polish. Designed and printed on Long Island in New York. Dolce Press is the innovation of Alexandra Daley, a design veteran who operates out of Long Island, New York. As a graphic designer, it was only natural for Alex to want to broaden her artistic vision and share her work with the world. This desire inspired her to learn, and eventually master, letterpress printing, which is, in her words, a technique that is "the ultimate in chic sophistication." Alex's use of crisp lines, graphics and eloquent typography has made Dolce Press a studio known for producing letterpress stationary that's made to impress. A stickler for perfection, Alex guarantees the kind of flawless implementation that will ultimately personify you or your event. Includes set of 6 cards with answer keys and envelopes. Please note, this item is discontinued, when it sells out it will no longer be available. ind inspiration in Alexandra Daley's crossword cards that feature over thirty hidden, holiday words, allowing senders to deliver good tidings their own way!